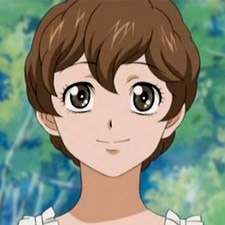 A classmate of Yumi's brother Yuuki at Hanadera Academy, "Alice" (as he is nicknamed throughout the series due to his feminine manners and androgynic looks) is a good-natured and lively young boy whose only issue is that his inner, feminine identity is at odds with his male biological body and his typically virile first name, Kintarou. He is a great fan of Sachiko's (going as far as saying that he had rather been born as a girl and gone to Lilian to be Sachiko's petite sœur). He seems to be good friends with Yuuki, and as a member of the Hanadera Student Council, gets to interact with the Yamayurikai for their respective school festivals. Sachiko's decision to switch the player's genders in the schoolplay at the Lilian Culture Festival overjoys him, as it gives him the opportunity to act a female part.